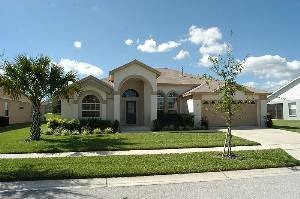 If you are looking for sheer 5* luxury then you have found it in our 4 bedroom/3 bathroom Orlando Pool Home. We are set in a prime location, on the prestigious development known as ‘Orange Tree’. Our home is both luxurious and very spacious, fully air conditioned, standing on a larger than average plot. 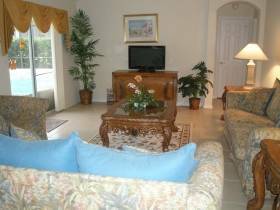 Our community is very much in demand, with a good reputation of where you can be guaranteed a very high quality home, which is why our vacation pool home has been awarded the American “AAA” diamond rating, which is equivalent to a hotel 5* rating. Explore the quality and layout of our villa for yourself through the virtual tour www....com and gallery of photographs. 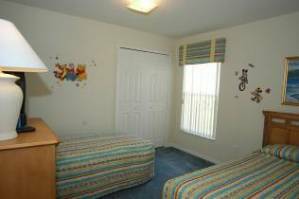 A prime location for all the major Theme Parks, but especially Disney, which is only 10 minutes away. This makes it possible for you to visit the parks, come back for a relaxing swim, or a soak in the spa, and then go back to the parks again later in the afternoon/evening. Local restaurants, Walmart’s, Pharmacy & shops, are only minutes from our home. The Master and Queen bedrooms both have an en-suite bathroom, making it ideal for two families sharing, or for two couples who wish to have that little extra privacy. 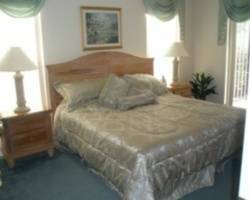 Cable TV/ DVD’s to all bedrooms. 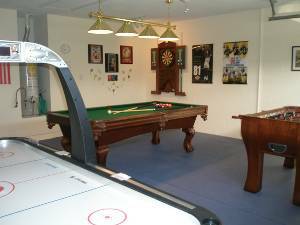 Stunning fully fitted Games Room with Pool Table, Air Hockey, Foosball & Darts Board. DVD with a selection of films to suit all ages. 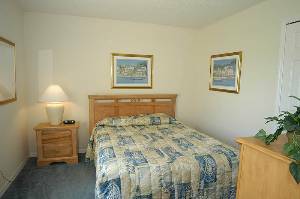 In one of the twin bedrooms you will find an additional VCR so the children can watch some videos. Every aspect of our home has been carefully chosen, so that it meets both our and your high expectations. For added luxury all our drapes have been custom made. No need to worry about packing bed linen, towels or pool towels as they are all supplied for you. Your children have not been forgotten either. For them, we have a travel cot with all sheets & blankets, highchair, stroller. Orange Tree boast excellent recreational facilities, with a children’s play area, basketball courts, tennis & football courts, all set in a 5.1/2 acre park. For all of you that are golf enthusiasts, our home is ideally located for numerous award winning/spectacular golf courses. Especially for all our guests, we have been able to secure a 20% discount off advertised rates at both ‘Legends Golf Course’ and ‘Kings Ridge Golf Course’. ‘Mystic Dunes Golf Course’, we are able to offer you a discount of $40/50 off advertised rates. If you want to try something different then why not try a hot air balloon ride which takes off locally. For your peace of mind, our home has been fitted with a monitored security alarm. Our local Management Company is only a few minutes away and is available to our guests 24 hours a day to help with any queries or emergences that may arise. We are sorry but no smoking or pets are allowed in our home. On entering our home, you will walk through the foyer to the formal living room. Here you can relax with a good book chosen from our collection, or listen to a CD and unwind. Formal entertaining for your family or guests. Great for those special occasions or for that romantic meal. 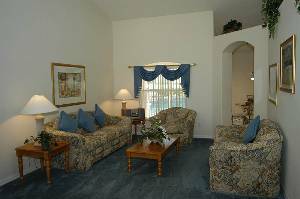 The family room has a large vaulted ceiling, which makes this room light and airy. Patio doors lead directly out to the pool/spa area. For your enjoyment we have Cable TV, complete with VCR, DVD with a selection of films for both adults and children. Playstation/games. A good selection of board games. FREE Broadband Internet Access. Relax first thing in the morning with breakfast and coffee as you overlook the pool. Watch out for the hot air balloons going over or you might even be lucky if up early enough to see our very own “armadillo”. Patio doors lead out to the pool deck. Fully fitted gourmet kitchen supplied with all utensils, crockery, cutlery and glassware. A full size cooker, built in microwave oven, fridge/freezer with ice making machine, dishwasher, toaster, coffee jug, & garbage disposal unit. Located off the kitchen is the laundry room with full size washing machine, tumble drier, iron/ironing board. If you want luxury then look no further. This suite boasts an American King Size bed. Your own private access out to the pool/spa, ideal for those early or late morning dips. Large walk-in closet. Digital safe. Walk in shower, tub, w/c and his & hers vanity sinks. Cable TV. Hairdryer supplied. This is the second of our en-suite bedrooms. Bathroom with walk-in shower, vanity sink & W/C. Your own private access out to the pool deck. Cable TV. Hairdryer supplied. Both of these are twin bedded room. Cable TV to both rooms. 3rd Bedroom also has an additional VCR. So many of our guests have loved the luxury of a 3rd bathroom. No more waiting around. Bath with shower, vanity sink unit, W/C. Hairdryer supplied. Full size washing machine & tumbler dryer. Iron/Ironing board. Now if you want the wow factor, then look no further. Our large designer pool/spa is quite unique with the large spa being able to convert to a children’s pool. The pool deck has been laid with Stucco block paving which gives it a stunning look. Privacy hedging around the outside of our pool enclosure ensures that you have the utmost privacy. Safety of your children is very important and so there is a safety fence fitted around the pool area. Upgraded patio furniture has been chosen with your comfort in mind. The pool’s south west facing aspect allows you to enjoy the warmth of the Florida sun without having to move your luxury poolside loungers around all day. For those of you that like a little shade, there is a covered lanai complete with ceiling fan to keep you cool. This is certainly one of my favorite areas to relax in, enjoying a bottle or two of wine, while the men cook the dinner on the BBQ !!! Watch out for the fireworks from Epcot. Children's Playground, Tennis courts, football pitch, basketball courts. Close to Championship golf courses- discount for Orange Tree Guests Hot air baloon rides. Our Brand New Executive Villa is situated on the Solana Resort Community which is located on the US27 between the 192 and the I4. Located in what is known as the 'Golden Triangle' of vacation villas. Brand new games room with Pool Table, Air Hockey, Foosball & Darts. Private Designer pool/spa, south west facing so sun all day long. Lanai with ceiling fans for those who would like a little shade. King master suite. Direct access out to pool/spa. TV/DVD Player. Digital Safe. Walk in shower. Luxury of a second lounge for quiet time and relaxation. Queen bedroom with en-suite. Direct access out to pool/spa. TV/DVD Player. Disney themed twin bedroom. Cable TV, DVD Player/VCR player. Thanks to you for the use of your wonderful home. We have had a fantastic holiday and achieved all that we set out to do - 14 parks !!!! It was so good to get back and relax in the spa. Thanks to Dave & Marie for sharing their lovely home. Our second visit and we did not want to leave. Everything we could possibly want and more. Looking forward to our next visit. Cancellations and Refunds: Please see owners website www....com to view our Terms & Conditions. 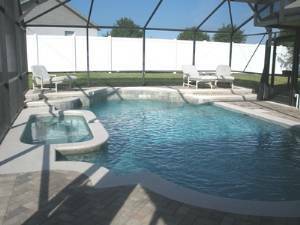 Other Fees: $54 Property Protection Tax per booking Pool/spa heat $210 week. Payment by credit card incurs a 5% administration charge.